The term Constructivism was adopted by Nicholas Onuf in 1989 and introduced as "people and societies construct or constitute each other". the main assumption of constructivists is that the fundamental structures of international politics are social and these structures shape actors' identities and interests. Therefore, the world is structured by both knowledge and material factors, according to constructivists the main important relation is between agents and structures. Moreover, constructivists adopt a common concern when understanding and explaining how international structures are defined by ideas and how identities and interests of the states and non-state players are influenced by the structures. From a constructivist approach, the main problem in the post-Cold War world is how various groups visualize their interests and identities. However, power is not unrelated. Constructivism focuses on how ideas, norms, values, and identities are created and constructed, how they develop, and how they change the way states comprehend and react to their situation. Thus, it matters whether the US adopts or denies its identity as "global policeman and whether Europeans realize themselves mostly in national or continental terms. Constructivist approaches are highly varied and do not provide a unified group of expectations on any of these matters. Constructivism theory discusses the issue of anarchy in the international system, At a simple conceptual level, Alexander Wendt claimed that the realist conception of anarchy does not explain why conflict occurs between states enough. The main thing is how anarchy is understood, and Wendt argues that "Anarchy is what states make of it.” He also argues that transnational communication and shared civic values are weakening traditional national obeisance and make an extremely new genre of political alliances. Furthermore, Constructivist theory focuses more on the role of norms, claiming that international law and other normative principles have decreased mainly the notions of sovereignty and changed the legitimate purposes for which state power may be used. The end of the Cold War came as a surprise to the classical dominant theories, who failed to predict or explain the changes in global politics. However, it provided the opportunity for more evolution of critical thoughts, which started since the mid-1980s. 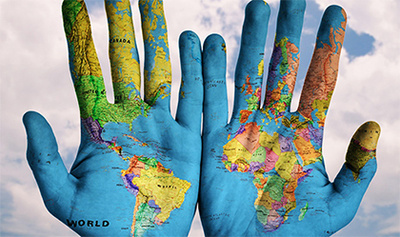 The Realist approach in international relations was criticized largely for their materialistic approaches by constructivism, which speedily boomed and was known as a theory that focuses on the social dimension of international politics. This improvement towards the chance of change helped the theory to catch significant elements of the world's relations: the many factors of mainstream presumptions and norms in world politics, which were threatened and challenged by constructivism. 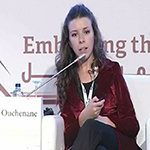 Ms. Ouchenane was researcher at Algiers University from 2011 to 2018. (Department of International relations and African studies).